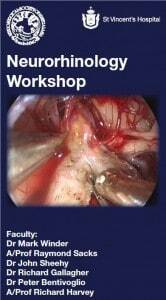 The Neurorhinology Workshop alternates yearly with the Orbital Course, and takes place on the last Saturday of January at St. Vincent’s Hospital. The course is aimed at practising surgeons and registrars. Both neurosurgeons and otolaryngologists are welcome. The morning will be devoted to lectures and dissection on sphenoid and sella approaches. The afternoon session will be dedicated to extended approaches. The course is CME accredited. 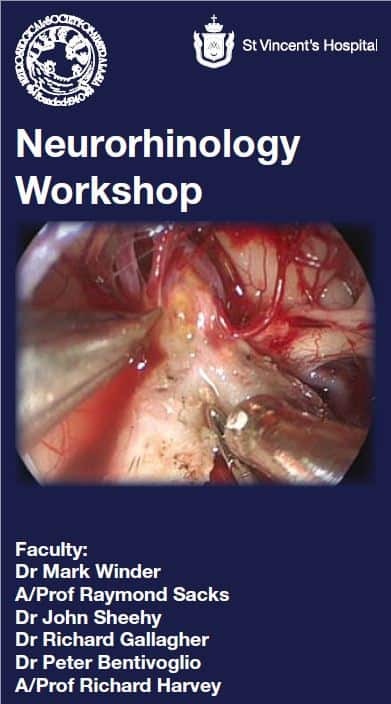 The next Neurorhinology Workshop will take place on the first week in February, every second year. The current cycle is 2011, 2013, 2015… Please contact Margi Griffiths for an application form or this year’s course details. For more information, download the 2011 course brochure.